Oil, and its major liquid-fuel derivatives (petroleum [gasoline], diesel, kerosene and aviation fuel), are incredibly convenient energy sources. They are energy dense, easily combustible yet relatively stable, and represent an abundant, naturally available energy carrier. Oil underpins our massive modern transport fleet. But what do we do when the oil runs dry (or, indeed, as prices rise following the plateau/peak that we may have already reached), and carbon restrictions tighten? Well, there’s no other obvious natural energy carriers for use in transport. But we can make them, by drawing on natural processes (biodiesel and bioethanol), or using stationary energy inputs to create chemical-electric batteries, hydrogen fuel cells, purified metals, etc. In the former case, the enegy input comes from a solar source in the form of biomass (via photosynthesis), and in the latter, it must come from technosolar, nuclear, or fossil fuels such as coal and natural gas. Hydrogen is often touted as the obvious future energy carrier (other than electricity), but it faces substantial technological and logistical obstacles, such as high conversion losses (60 to 80% reduction compared to original energy input), extreme volatility, energy required for compression to a liquified form, piping embrittlement and leakage, storage volume problems, the need to construct a new, massive distributional network, and so on. The problems are detailed here and here (but for a counter-critique of some points, see here). I should note that hydrogen is NOT an energy source, despite the oft repeated allusions in the media, because hydrogen does not occur naturally on Earth). Some are optimistic that storage of hydrogen in metal hydrides will solve some major problems, but that requires considerable R&D. I’m cautiously optimistic of metal hydrides, electrochemical compression, and proton exchange membrane fuel cells and parallel path magnetic technology, in particular. But they’re not ready and proven — yet another area where a massive investment in energy technology and engineering development is needed NOW, if we are to have readily exploitable fossil-fuel-free energy systems in the medium- to long-term. But speaking the other day with an engineer from one of Australia’s largest steel manufacturers (OneSteel Whyalla), he raised an interesting issue regarding hydrogen that is quite separate from its use as an alternative transport fuel. I was previously quite unaware of this remarkably important role for hydrogen. Although the efficiency of blast furnaces is constantly evolving, the chemical process inside the blast furnace remains the same. 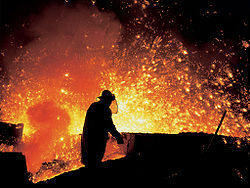 According to the American Iron and Steel Institute: “Blast furnaces will survive into the next millennium because the larger, efficient furnaces can produce hot metal at costs competitive with other iron making technologies.” One of the biggest drawbacks of the blast furnaces is the inevitable carbon dioxide production as iron is reduced from iron oxides by carbon and there is no economical substitute – steelmaking is one of the unavoidable industrial contributors of the CO2 emissions in the world. It’s well known that you can fuse two pieces of haematite (Fe203) with an oxygen reduced welding torch. Obviously electrolytic hydrogen is too expensive for smelting. Another huge application is plasma gasification of garbage or biomass. The syngas doesn’t have the stoichiometric amount of hydrogen to be catalytically converted to methane. Add some then pass over nickel catalyst (CO + H2) + 2H2 -> H2O + CH4 easily separated products with methane gas having a superb energy density of 55 MJ/kg. Blend as needed with natural gas in modified trucks. I wonder what the OneSteel bloke thinks of the Whyalla desal or my idea of the Great Australian Bight (ie not Spencer Gulf) as an energy hub. The H2 pipe to the post-carbon steelworks might end up 200km long. I thought a lead cooled reactor is limited to about 500C due to the corrosive properties of Pb above this temp.What is the lowest temp for sulphuric acid dissociation and the thermodynamic efficiencies?. While we are burning coal or biomass for electricity it seems that we should focus on replacing those activities first, and maximizing recycling of scrap to reduce the need for additional iron ore reduction. We already have the blast furnaces as BHP found, its expensive to play around with other reduction systems, in their case using methane. Very interested in your recycling queries Neil. Current ferrous/ferric scrap prices are approx $80 p.tonne, down from above $200 plus of Sept 08. I don’t know what the corresponding ore price is but it must be an interesting question with scrap proximity to Port Kembla/Whyalla or any other electric arc furnace. Scrap aluminium is even more interesting as it is estimated recycling costs are only 10% those for producing from raw bauxite. Scrap prices have halved since GFC hit which from an environmental POV is salutary I believe. But then I don’t believe we should be using aluminium in a disposable can anymore. So if you find FeO in nature, it always is sufficiently mixed with other oxides to stabilize it against this disproportionation. So where do you get straight ferrous oxide? From a high-temperature furnace that heats Fe3O4, causing it to lose one-quarter of its oxygen. This is one of the steps in my proposed boron deoxidation method. These scrap prices are just reflecting drops in steel and aluminum, still much higher than a few years ago. Nothing wrong with aluminum cans if 100% recycled. Considering the siting issues of the two, you may wish to site and construct your reactor first and then build a few blast furnaces around it. I agree with Ed. Don’t build a reactor next to an established coal using facility just because it seems convenient. Some have suggested that steam turbines from coal plants could be switched across to nuclear boilers at the same site. However that coal plant is likely to look grimy, smell funny, have poor security and to be contaminated with tars and heavy metals. The locals will probably have archaic mindsets. Same goes for steel mills using coking coal. Whyalla I believe gets most of its coal by ship from Newcastle NSW since SA coals are unsuitable. In my opinion reactor sites should be clean and uncluttered. If necessary locate them way out of town even though there will be energy penalties for longer electrical transmission and water pumping in the case of desal. There may be some seepage in lengthy hydrogen pipelines (eg from a reactor to a hydrogen based iron smelter) but the GHG potential will be trivial compared to using coal. In an ideal situation, I’d agree John, and perhaps that can work for Australia. But for places like China, the coal2nuclear strategy will be imperative, as there will be no other way to eliminate the 600GW and growing coal infrastructure, well before their official retirement date many decades henceforth. Coastline like this 300km due west of Whyalla has much greater ability to disperse heat and salinity from currents as opposed to tidal flushing. In all likelihood both the steelworks and the large new desal at Whyalla will be fossil fuel powered for decades to come. production is another spin off. Ammonium sulphate from uranium processing at Olympic Dam is sold as a fertiliser with one of the inputs I presume being gaseous ammonia. ANU and Uni of SA were going to jointly build a solar thermal plant at Whyalla using ammonia dissociation as a storage method. Oddly ammonia is a pollutant at OneSteel since the current technology needs coke ovens. Without carbon penalties or drastic fossil fuel depletion nothing will change. … fertiliser production uses about 1% of global energy with the reactions taking place at high temperatures. But I don’t know about GHG emissions associated with the process. Are they just associated with the heat generation, or are they part and parcel of the chemistry. If an IFR can provide heat + hydrogen, then fertiliser production is another spin off. Any electricity source can provide hydrogen, and hydrogen and nitrogen spontaneously — in the thermodynamic sense — combine to make ammonia. The spontaneity is helped by high pressure and temperatures on the order of 200°C. John Newlands spoke of using ammonia dissociation as a way of taking up heat. The idea, such as it is, is that you can reassociate the stuff when you want the heat back. It’s true that when hydrogen and nitrogen combine they release a little heat. That such a thing could be seriously proposed as a heat store suggests that catalysing the reaction has become cheaper than it used to be. But you would have to store seven times as much hydrogen per unit of producible heat as you would if the substance you would combine it with was oxygen. Carbon sequestration is another approach to reducing CO2 from processes such as steelmaking and cement manufacturing. Has the attraction of being an easy retrofit to a steel or cement plant. However, not sure re how close the logical storage site is to either Whyalla or Pt Kembla. You would still have the greenhouse emissions generated in the mining of coking and PCI coal. CSIRO data says that steelmaking emissions can be reduced from 2.3 down to 1.6 t CO2/t steel by replacing blast furnaces with the combination of electric furnace and natural gas reduction. (I am assuming H2 reduction would use same plant. However, the figure suggests that the 1.6 does not include any electricty foot print. I suspect the cost/tonne CO2 reduction will be a lot higher than the cost of acheiving the same reduction from the cleaning up of electricty or other easy to fix steps. It all says wait and see if a source of cheap H2 becomes avaialble. In terms of hydrogen carriers, ammonia (NH3) is excellent. There a guy in Iowa who is already making ammonia-powered engines for farmers (because they have ammonia at hand). It works very well and if you use a catalytic converter, it’s pollution-free. He says it costs about $1,000 to convert a standard infernal combustion engine to ammonia power. Farmers are fueling their tractor engines with it now. We already know how to make the stuff, how to handle and distribute it, and we could get hydrogen production from VHTRs (still more R&D for that) or IFRs (via electrolysis). For those who consistently throw up that ridiculous “nuclear will never be economical because we don’t need 100% output around the clock” this is yet another use for 100% output, along with desalination (and ultimately boron recycling). Again, like hydrogen itself ammonia isn’t an energy source, but an energy carrier. Ammonia-powered cars might not be as slick as boron, but the technology is ready to go and it could act as a bridge technology while the boron engine R&D is carried out, allowing us to wean ourselves away from oil sooner. Of course we need the electricity to make the hydrogen. So let’s build a bunch of IFRs, secure in the knowledge (sorry, Ender) that we’ll have plenty of good uses for all the power they can generate 24/7. Would it require mandates, Tom, or have you already converted all the cars in your household? For 30-plus years, everything the hydrogen economy has needed has been in place, except customers. With boron it’s the other way around. That is not the problem. How do you modulate the output of these sources to precisely match demand with supply? Presently with peaking generators these can be cut in and out very quickly to stabilise the grid in both voltage and phase when large loads cut in and out. All these large loads will destabilise the grid especially if there is a large fraction of the generating capacity is non despatchable like thermal nuclear. This will require even more ancillary services as more of these large loads are added to the grid. You would have to have a significant portion of the IFRs in load following mode which means their capacity factors drop below the economic minimum usually necessary for large capital expense sources like nuclear. You will always be undersold by cheap peaking capacity which can run from renewable sources like biomass or solar hydrogen. Also you will be displaced by other renewable sources like wind as they can dump cheap power on the grid. I am sure that you will have plenty of uses for the surplus power however cutting them in and out will result in the need for even more peaking power to cope with the fluctuations. Unless of course you somehow design your desalination plants etc to be instantly variable in output via automatic controls. Whatever future non FF energy is used we are going to need some regulation of demand. It seems that desalination can definitely respond to available electricity as can hydrogen generated from electricity, but at some cost to efficient use of capital.Hydrogen also has a large energy loss when going back to electricity. It will probably be less expensive to use desalination and hydrogen to modify demand than reducing nuclear or wind that have very low marginal costs. Solar CSP with 2 hours thermal storage seems the best way to supply peak demand if prices can be reduced so that it competes with NG, otherwise we will have to wait until NG becomes more expensive. As Neil says, both hydrogen production (for energy carriers like ammonia) and desalination (and eventually boron recycling) can fluctuate to soak up excess electricity (or heat, in the case of desal) as it’s available. [What, too many parentheses in one sentence?] So despite the fact that IFRs are good at load following, they would be able to run full out constantly. This would, of course, mean that those ancillary systems (desal, electrolysis, boron) would only be running part time, and so wouldn’t be achieving their maximum possible economic output. But that’s always going to be the case with any combination of systems because of the inexorable variability of demand. So you design your systems in such a way as to minimize the economic losses, just as we do today. It’s not rocket science. Wind and solar with storage have the same problems, only more seriously. Which, by the way, inspires me to point out that the energy storage systems that you keep touting for wind and solar can as efficiently store energy from nuclear plants, which kind of undercuts your repeated arguments about how load following is such a problem with nuclear but not with the others. The cost of nuclear has many question marks, but more significant, is the long build time even in China.This is even more of an issue for Australia if everyone else is scrambling to build. Interesting to see that Worley Parsons( ASX ticker WOR), an Australian company is building a new reactor in Egypt, so if we wanted to build nuclear we could at a price. How quickly is another issue. About 1974 there were 40-50 reactors being started every year, and nuclear power plants recently have been built in as little as 39 months (in Japan) and at a very reasonable cost. In the mid-70s, this relatively massive rollout wasn’t even done under a sense of environmental urgency. The cost and time to build issues are simply not valid. It’s not a matter of cost or time, but of political will. Sure, we can put up with dysfunctional regulatory systems and gouging utility companies, but that doesn’t mean that nuclear power is the culprit. It isn’t. I completely agree as both renewables and base-load nuclear plants need some sort of peaking power. I am advocating first reducing demand through conservation and efficiency then employing a mix of different renewables widely spaced and inter-connected backed up with automatic peaking plants to provide virtual “baseload” power. Some countries will need nuclear and for that I advocate the LFTR rather than the IFR. I don’t happen to think that building expensive desal plants just so we can over build nuclear is such a good idea. In most cases water conservation will achieve the same aims as desal without the environmental problems that desal plants can have. Hydrogen production will happen eventually. I agree that hydrogen has losses going back to electricity however we will need some non fossil hydrocarbon to provide fuel for peaking plants or deploy large scale storage. V2G cars should provide some of this however hydrogen, especially if it has other uses such as transport fuel and steel making, may be worth storing energy in despite the losses. If you think the way nuclear plants were built in the 1970 and 1980 in US and would be happy for that roll-out to be repeated then you are dooming the industry to further WOOPS, Browns Ferry, 3mile island type events, with massive cost overruns, skipping X rays of welds, poor training etc etc. They may have started 40-50 reactors per year but they didn’t complete half of them. Not a pretty picture. Perhaps Japan will be lucky, perhaps China is doing a better job, we will see in 2013 when large numbers of reactors are due to be completed. Let’s hope they are not taking any short-cuts and that regulation of the nuclear industry is better than in the Chinese food industry. A nuclear “melamine” could do considerable damage. Probably similar mistakes are being made with the rapid roll-out of wind turbines, but a wind turbine failure has few consequences, how many more nuclear “mishaps” can the US take or cost overruns can the power industry finance? Then who is going to pay for them knowing that they will only run part time? Who is going to pay for the load following nuclear reactors that also only run part time? Do we have to subsidise them not to produce anything? What happens if water demand coincides with maximum electricity demand? Of course they can however you keep touting that an overbuilt nuclear solution needs none of these and only wind and solar need backup. I have grave misgivings about at least two of the parts of P4TP as I consider the boron car a non-starter and the GREAT idea non-workable. The IFR on the face of it seems OK however in my opinion the LFTR has more advantages. I like the fact that you mentioned energy efficiency in the book as I believe that this is the way to go to reduce demand. The future will be a mix of energy not one silver bullet. I would like to see in Australia over 70% renewables with coal completely phased out and no nuclear as I consider we do not need it as we are abundantly supplied with renewable resources. Other countries may need some nuclear however I would like then never to produce or use plutonium which should be banned by international law. Hydrogen will have a role to play as an energy store in the future however it can be produced from any energy source and we do not need many IFRs to do it whether or not they are running flat out or not. Solar fuel is free and high temperature beam down towers can produce hydrogen just as easily as nuclear. They also can participate in a zinc cycle that reduces the need for hydrogen storage and raises the efficiency of the hydrogen cycle. Some countries will need nuclear and for that I advocate the LFTR rather than the IFR. Remind me why that is again. Neil, what a lot of strange arguments you make. Why do you imagine that lessons burned and learned in the past would be repeated, when the US industry is running so efficiently and safely today? Why do you imagine Tom is talking only about the US, when France, Sweden, Korea, Japan etc. built hundreds of reactors over that period? Why do you conflate the food industry with the nuclear power industry in China, which is as absurd as conflating the automobile industry with the aircraft industry in the US? You are clearly a strong promoter of wind, and that’s fine — it has it’s place, and it could possibly be a significant one. Time will tell. But your comments on nuclear power are becoming increasingly bizarre. You’re kidding, right? Desal water can be produced at any time and stored in tanks or reservoirs. Electricity storage is quite another matter. How do you propose to reduce demand in China and India? Also, I asked you before what your plan for eliminating the existing and soon-to-be-build coal in China and India was, and you never answered me (or I missed it, in which case I apologise). Say your 70% renewables dream for Oz is somehow realised. What about the other 30% of zero-carbon energy? So are the sticks you can collect in your back garden. How does free fuel help? That’s my point the lessons have been taken on board by US nuclear industry, thus we have longer build times and detailed licensing the so called “dysfunctional regulatory systems” by Tom. Scrapping these in the name of faster build times or lower costs can back-fire. I am totally in support of nuclear power, but we have to accept some realities the first reactor in Australia can’t have any major stuff-ups or it will the the one and only for a long time. If that means 12 years design and construction, we have some short term fixes( wind energy). Longer term I think solar and nuclear will make a better fit for Australia, but Canada and UK nuclear and wind. This is the legacy of poor nuclear practice. Much of what I refer to as dysfunctional regulatory systems was epitomized by the regulatory ratcheting that happened in the 70s and 80s. For a good education about stratospheric nuclear plant costs and why the new designs should be able to avoid them, you can hardly do better than to read this. It’s but one chapter in a terrific online book about nuclear power that I heartily recommend to anyone who wants a really good overview. Some of the problem is still just a carryover from those days, for a lack of decisive support from government still has utilities and investors skittish about possible lawsuits from anties, which can cause delays of years and make the costs balloon. Then you have the NRC being woefully underfunded and understaffed, making the certification of a new reactor design cost about a billion dollars (even for the EPR, which is already certified and being built in Europe) and take years and years to obtain. Power companies are allowed to charge their customers in advance for power plants not yet contracted for with designs that haven’t yet been certified, based on costs that they are allowed to estimate. Any wonder that they’d be tempted to estimate on the high side? It’s an invitation to gouge. All these are what I refer to as dysfunctional. The raw materials cost for a nuclear reactor is about $35/kW, even at current prices for concrete, steel, copper, nickel, etc. There is no way that costs for building a power plant should be $5-8000/kW, and in the Far East they aren’t. Why are they estimated at that level in the USA? That’s dysfunction. The new designs are inherently way safer than those currently operating around the world. You don’t have to take a decade to build them to make sure they’re safe. Maybe hydrogen will get up at some time in the future. However, my guess is that it is unlikely to be based on electrolysis. There are plenty of interesting alternatives being investigated at the moment. Hence arguing for nuclear on the basis of hydrogen production simply reduces credibility. Similar comment about desal – it makes a lot more sense to use wind, tide or wave power to directly provide the bulk of the pumping without the need to generate electricty to drive the pumps. There is plenty of scope for extending the offpeak power concept to provide consumer demand flexibility. Most household uses except light and cooking can be designed to tolerate at least short periods with power off. similar comments can be made about new applications such as charging electric and plug in hybrid cars as well as a raft of business applications. Okay, that’s fair enough, and I agree about the nuclear+solar and nuclear+wind synergies. This is of course sensible, and is where Lovelock is quite wrong. But one of my points was that short build times do not need to equal shoddy practice or poor training. You can have a fast build (of 36 to 44 months, as has been the examples of recent Asian builds) due to better industrial and managerial practice, design standardisation and improved engineering practice and experience, more factory-built and ship-to-site components, etc. It’s a matter of being cleverer about the rollout, not taking short-cuts. We all absolutely agree that stuff-ups are simply not an option. While I agree that hydrogen as a direct fuel is a difficult, costly, and dubious proposition at best, the possibility of using it in a more stable and easily handled molecular form such as ammonia is entirely possible and would allow us to wean ourselves off of oil sooner, even before boron or more versatile electric cars take over the roads. The very high temperature reactors envisioned for more efficient hydrogen production are still hindered by materials difficulties (because of the aforementioned very high temps). Imagine, if you will, that a substantial amount of IFRs are built, sufficient to provide all the energy that’s needed even on long stretches of cloudy winter days when the wind is still for extended periods of time. Yes, that happens (ask someone in Germany). Right now coal and gas are filling the bill, but in our future non-fossil fuel world it’s IFRs. Nowadays rather than use the electricity that fossil fuels provide to produce freshwater or hydrogen or pump water into reservoirs for later use when electrical demand is low, we simply throttle them back because it’s expensive to run them. IFRs, though, run on fuel that’s essentially free and unlimited. So the relative inefficiency of using their electricity for these other purposes when not in demand for the grid makes sense if we have a use for the fresh water, hydrogen, etc. I don’t see that pointing out that fact undermines my credibility. It’s a matter of breaking loose from old thinking patterns that don’t apply to a future where IFRs are a major power source. As for your comment about desalination, I heartily disagree that “it makes a lot more sense to use wind, tide or wave power to directly provide the bulk of the pumping without the need to generate electricty to drive the pumps.” How, exactly, is it possible to directly use wave power to do desalination? And what sort of pumping are you talking about? The main process of desal using reactors is a heat process, there’s not a whole lot of pumping involved. Whatever is involved could surely be easily accomplished with electric pumps, far more efficiently than trying to directly harness tides or waves or wind. That comment blew right by me. Am I missing something? Tom, if you can pump seawater at high pressure (mechanically or electrically), then you can force it through a reverse osmosis membrane and achieve desalination, without any involvement of heat or electricity. The CETO wave technology claims to make use of this method, though the proof on a large-scale (or not) will come in the next few years as they deploy larger fields of pumps. Flash distillation via nuclear is of course an equally good, perhaps much better (potentially more cost efficient) way to do it, but there are multiple possibilities that can and should be considered. I’m glad I asked if I was missing something. I was! Sounds like a very cool technology. I hope it works. The raw materials costs of a new car are only $500, no way is it going to cost $25,000 for a car! I think it’s due to the costs of manufacturing. No I was just point out that desal is not a solution for overbuilding. Consider Perth for example. We have a peak demand of about 3800MW with and installed capacity of 4110MW. Our operational reserve is about 250MW at any one time. So lets implement the overbuild and install 4500MW of IFRs to allow for growth and systems down for maintenance. The usual off-peak demand over the year here is about 1000MW lower than the daytime peak and bottoms out at about 1300MW. So you will have between 1000MW and 2200MW of capacity to use up to keep all the generators running flat out. The newly installed Perth desalination plant takes about 50MW of electricity to supply 17% of Perth’s water demand. It cost $387 million. So to use your overbuilt capacity we would have to build up to 2200/50 = 44 plants at a cost of 17 billion dollars. This would oversupply Perth to the tune of nine times its demand quite apart from where do you site 44 desalination plants and what the effect on the environment would be. Also the Perth desalination plant is one of the most advanced in the world and has made advances in using less energy which is contrary to what you want to do as you need the desal plants to use as much energy as possible. Basically what you will end up doing is discouraging innovations in energy efficiency as you have an abundance of cheap energy that you need to get rid of. Another point is the pricing of the power. The power from this system will be priced close to zero because supply is so much higher than demand. Even though the statement “too cheap to meter” is mythical you are close here to bringing the zombie to life. The cheap off-peak power will start attracting other high energy users like aluminium smelters that will demand low prices all day not just off-peak. As you have surplus power that you need to get rid of you will be helpless to demand higher prices as you need the big loads more than they need to be there. This situation is the exact opposite of what we desire. This system is encouraging higher energy use rather than discouraging it. Which brings me to summer peak times. With all these new loads that you have attracted you now need to limit peak demand by implementing energy efficiency. This is to avoid the situation where it is 40deg and you have the perfect storm of 2 large power stations down with faults and you need 3900MW to meet demand. The overbuilt solution has the problem of plenty of power when you don’t need it and not enough on the 2 or 3 days a year when you do. So on the one hand your big loads you don’t want efficient but the small domestic loads you do want to be as efficient as possible leading to the ridiculous situation of encouraging demand from one sector while discouraging from another. For this and so many other reasons that I have pointed out in the past yours and Tom’s idea of overbuilding and then adding loads to make up demand is not workable in the real world. The solution is to build a 2GW HVDC link from Norseman to Pt Augusta, when it’s extra hot in WA you have southerly winds in SA, and a 1 1/2hour delay in peak demand. Even a 50MW reduction in the peak helps. Neil Howes – Completely agree here. You could also tie in the geothermal energy from northern South Australia. 2. The LFTR, as it uses a gas turbine, can interact with renewables much better than the IFR. Thanks for the link to the Perth desal plant. As for your ceaseless argument about overbuilding, it’s not getting any more salient. One way or the other you have to build enough capacity into your system. If the cost per kW for a nuclear plant is less than the cost per kW of any other kind of plant, how does that put nuclear at a disadvantage, when it can run anytime and is good at load-following? You’re ALWAYS going to have plants idling part of the time. It’s not something special about nuclear plants. The fact that you can use the extra energy for hydrogen/ammonia production or boron recycling (eventually) or, yes, desalination because it’s so cheap to keep them running instead of spinning them down is a bad thing why exactly? And the fact that you could store the extra energy for later using exactly the same techniques you and others tout for solar and wind power would mean that (if those systems work as advertised) you could overbuild by a lot less and still be just fine. Your endless harangue about how overbuilding nuclear is a deal-breaker is simply bogus. No matter which system or combination of systems you build, you’ll always overbuild. As long as nuclear plants aren’t ridiculously more expensive per kW (or per kWh, more to the point), nuclear is at no disadvantage compared to any other system. And it’s NOT more expensive. The new designs will be far cheaper than wind or solar per kWh capability, and WAY more reliable. Quite right Tom. electricity is infrastructure that needs surplus capcity to handle peaks and unexpected demand growth. However, current practice is to use low capital gas turbines to provide for peak demand on a hot day etc. Would be surprised if the marginal capital cost for nuclear will compete with gas turbines until we have got close to the end of the electricty clean-up process. Keep in mind too that some renewables provide the most power at times of peak demand. Think solar and the peaks that coincide with high air cond demand in the middle of a hot day. 1. Wrong. You can bleed 233-Pa from the salts as it is bred from 232-Th, and wait for it to decay to 233-U — a perfectly fine bomb-making material. Or, you can wrap a 238-U breeder blanket around an LFTR and breed 239-Pu. It is no more (or less) inherently proliferation resistant than the IFR, except that you’d need to build more specialised facilities to separate 239-Pu from an IFR, since pyroprocessing doesn’t allow this. Point is, both LFTR and IFR are highly proliferation resistant, but the LFTR holds no trumps in this regard. 2. The gas turbine is possible, but is not the route currently being taken by the PBMR, which has ended up using a steam turbine. So it’s theoretical. Other reactors, including the IFR, can load-follow with a steam-turbine. Also, if you are not dependent on intermittent renewables, the synergy you desire ceases to be an issue. Fact is, both the IFR and the LFTR are highly desirable technologies. But your crazy vision of excluding Pu from any future nuclear cycle is profoundly naive. Apart from sort of undermining your own argument about the proliferation resistance of GEN IV nuclear there is an important difference. To make compact and deliverable nuclear weapons plutonium is needed. I discount the possibility of a terrorist organisation using nuclear weapons. The main danger is from nation states. While U-233 can make a weapon, the size of the resulting bomb makes it difficult to deliver or store. Also the designs for weapons that are available use plutonium. Not producing plutonium makes it far more difficult for nation states to produce useful weapons. Banning plutonium makes it relatively easy to detect. After the ban is in place plutonium = weapons with no peaceful uses to get in the way. Any country producing plutonium gets sanctions until they stop. The only exception would be to feed present nuclear waste to LFTRs to get rid of the long lived radionucleides. In P4TP the premise is that countries will trade unlimited energy for giving up ownership of their nuclear program. So here is a chance for you to prove the premise. I reckon I could get a plutonium ban GEN IV nuclear program past all but the most radical of the Greens. You could have Jim’s approval for nuclear – all you have to do is give up plutonium. So are you prepared to trade unlimited energy approved by the Greens for plutonium? With wind growing at 30% per year as it is presently you will have to deal with it whether you like it or not. So lets put in place systems that work with reality not imagine how we would like it to be. I have a quick look through the comments and it appears that no one has brought up the fact that wood can be used as a substitute for coal in steel making. It can be used in current smelters and just needs to be converted into char using the same process that turns coal into coke. As wood is much cheaper than hydrogen, and carbon is roughly twice as effective for smelting purposes as hydrogen, it is a much more economcial option. Unfortunately it (wood) also misses the point of creating a CO2 emission free smelting process, to say nothing of the forest destruction it would entail. The goal is not to produce CO2 emission free smelting, but to prevent smelting steel adding to the amount of CO2 in the atmosphere. Using wood can achieve this as the carbon in wood is taken from the atmosphere as it grows. There is no need for forests to be destroyed as trees can be farmed or harvested in sustainable ways. For example, the United States produces about 400,000,000 tons of commercial timber a year while increasing the total amount of forested land. But replacing all the coal used in steel making with biomass is a tall order. It would take about as much timber as is produced in the United States. Agricultural products besides wood can be used, but grass based crops may not be suitable due to the large amounts of silicon they contain. A tonne of wood only has about 0.35 tonnes of carbon and making bio-char only about 50% of the carbon is recovered as charcoal. Another reason not to use bio-fuels is that these will be more valuable replacing petroleum for plastics and chemicals via ethanol or acetylene. With very high rates of recycling we may not need as much new steel from iron ore in the future once China and India start re-cycling cars and construction steel. The US recycles 78% of steel. Char lacks the physical characteristics (strength) required to replace metallugical coke in the blast furnace. However, it could replace PCI (Pulverized Coal Injection)at the tuyeres. It may be possible to replace PCI with wood pellets instead of char. This avoids some of the costs and carbon losses associated with preparing char but would increase gas flow up the furnace which may reduce capacity. I should have mentioned before that wood, or charcoal made from wood, is currently used in steel production in Brazil. Ronald @15: Details re use of wood charcoal in Brazilian steelmaking? Extent of use? At its height, 8 million tons of charcoal was used in steelmaking in Brazil in 1993. The sequences in the nuclear fuel cycle are far from my pet field Barry, but isn’t it possible through use of an ADS to operate a Thorium reactor without Pu? I’m sorry everybody, but earlier I wrote that carbon was twice as effective as hydrogen for steel making. I don’t know what I was thinking. Carbon is about four times as effective as hydrogen. The efficiency of using nuclear reactors to produce hydrogen is estimated at being from 25-40%. Picking the figure in the middle gives 33% and we’ll assume that the plant is 33% efficient at producing electricity. Let’s also say that the cost of electricity in the area is low and can be sold for 4 cents a kilowatt-hour. As a kilogram of hydrogen has 143 MJ/kg the cost in foregone electricity sales will be $1.60 a kilo. Since hydrogen is about one fourth as effective as carbon in steel making, it would cost $6.40 to replace a kilogram of carbon or $6,400 to replace a ton of carbon. Even if new wiz bang technology increases the efficiency of making hydrogen to 66% it will still cost about $3,200 to replace a ton of carbon with hydrogen, and this doesn’t include the capital costs of the hydrogen making equipment. As carbon in the form of wood or char can be bought for much less than $6,400 a ton, or indeed $3,200 a ton, I don’t think hydrogen, whether generated from nuclear or other energy sources, will be used in place of carbon. Depends on what you mean by effective. It is CO that is the primary reducing agent in a conventional blast furnace, most of the coke is simply burnt to produce heat though some carbon participates directly in reducing iron in the hottest parts of the blastfurnace. Clearly, from an enthalpy stand-point there is no major difference in favour of producing CO from CO2 rather than hydrogen gas from H2O. There does exist solid oxide cells that can decompose carbon dioxide into oxygen and carbon monoxide with electrolysis; but I have no idea how efficient they are. So on the sheer sheer cost of hydrogen, at this stage my gut feeling is plasma burners — which the economist reports are already economic — will be the way forward. EN, I’m not sure I follow. Even with a plasma burner you still need a reducing agent (hydrogen, or carbon) to turn the iron oxide into iron. Maybe you could use plasma derived syngas, but then you’re still producing co2, and the syngas is probably better used for chemical feedstock anyway. All, done anyone on this tread live in Whyalla or surrounding areas? We have just registered a project that can produce hydrogen at a value that is comparable to Natural Gas.